These NC State students want to create a smarter dumpster that improves the efficiency of waste collection. NC State students Nick Conlon, Hartley LeRoy, Nick Sischo and Goutham Subramanian all had an interest in entrepreneurship, but they had no idea their first startup would focus on waste and recycling. 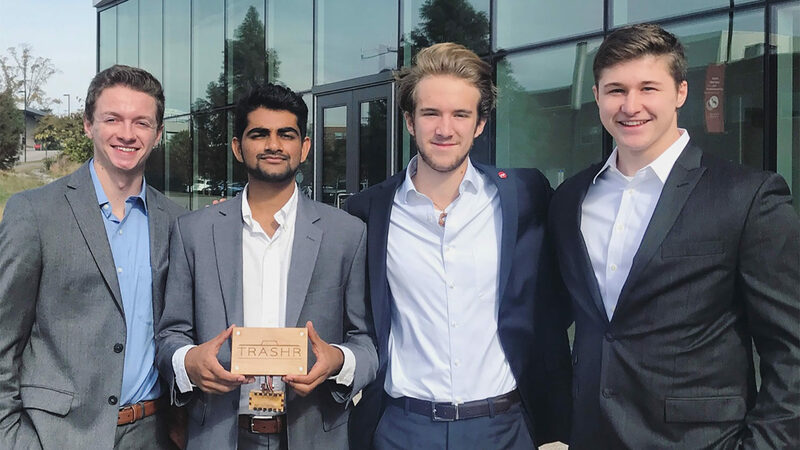 These College of Engineering students are founders of Trashr, a sensor technology that optimizes waste collection efforts to save time and money while also improving sustainability. 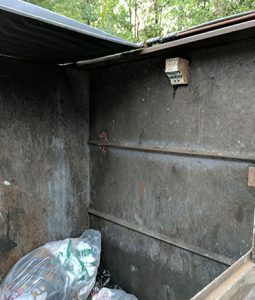 “We can check how full a dumpster is with a sensor. On a huge campus like NC State, this is really helpful for dumpsters in isolated areas,” Subramanian said. Instead of emptying faraway dumpsters on a weekly or daily schedule, Trashr will notify waste collection personnel when a dumpster is full. This results in improved efficiency, less fuel use and better waste management. 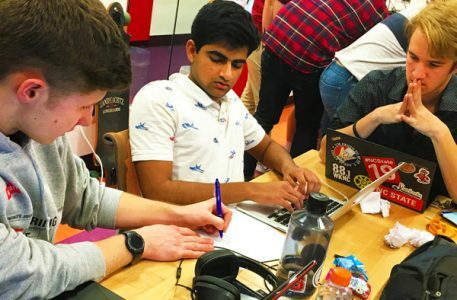 At the 2016 NC State Make-a-thon, Trashr was developed. In addition to winning the waste category, the project caught the attention of NC State’s Waste Reduction and Recycling Office, which offered the student team the opportunity to finalize and test their concept on campus. The idea for Trashr emerged in 2016 during Make-a-thon, an NC State competition that challenges student teams to prototype a solution to improve campus sustainability. “A couple hours in, we’re looking at all this data [about campus waste] and kind of flustered,” Subramanian recalled. Overwhelmed by the amount of waste and the management process, the team narrowed its focus on improving the efficiency of waste removal. What if well-placed sensors in dumpsters could alert waste management staff when a dumpster needed to be emptied? This could eliminate inefficiencies of emptying partially-filled dumpsters. After winning the waste category of Make-a-thon, the team reached out to NC State’s Office of Waste Reduction and Recycling. Lani St. Hill, the office’s outreach coordinator, helped the students understand the waste management industry, common operational challenges and the importance of their work. A few months after Make-a-thon, the team won an NC State Sustainability Fund grant to develop and test the prototype on campus. Partnering with Waste Reduction and Recycling, the students placed sensors on several campus dumpsters to learn what worked and what didn’t. A Trashr sensor prototype in operation on a campus dumpster. After summer internships with different corporations, the team reunited this fall more motivated than ever to develop a market-ready product. 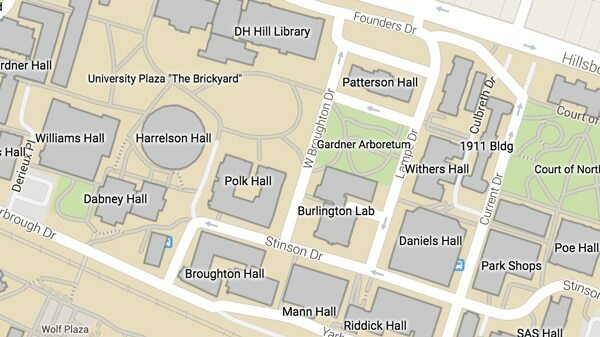 As they hammer out details ranging from patents and pricing to software development and analytics, the team is also further testing its sensors on campus. Now juniors, the team plans to continue refining the product, as well as a business plan.